Click the link immediately below to view the SAT Verbal diagnostic test. 1. If x and y are both prime and greater than 2, then which of the following CANNOT be a divisor of xy? Solution: Since x and y are prime and greater than 2, xy is the product of two odd numbers and is therefore odd. Hence, 2 cannot be a divisor of xy. The answer is (A). 2. Cars X and Y leave City A at the same time and travel the same route to City B. Car X takes 30 minutes to complete the trip and car Y takes 20 minutes. Which of the following must be true? I. The average miles per hour at which car X traveled was greater than the average miles per hour at which car Y traveled. II. The distance between the cities is 30 miles. III. The average miles per hour at which car Y traveled was greater than the average miles per hour at which car X traveled. The average speed at which car X traveled is (Total Distance)/30. The average speed at which car Y traveled is (Total Distance)/20. The two fractions have the same numerators, and the denominator for car Y is smaller. Hence, the average miles per hour at which car Y traveled is greater than the average miles per hour at which car X traveled. Thus, Statement I is false and Statement III is true. As to Statement II, we do not have enough information to calculate the distance between the cities. Hence, Statement II need not be true. The answer is (C). This interactive, comprehensive self-study course presents the equivalent of over 600 pages of printed material, including hundreds of SAT examples and problems and feedback from SAT experts to your questions. In addition, the powerful learning engine StudyDesk increases your learning efficiency by monitoring your progress and directing you to areas where you need further study. All for only $49.95! Click the link above for more information or call 1-310-275-3513. Solution: OS and OT are equal since they are radii of the circle. Hence, Triangle SOT is isosceles. 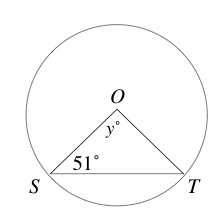 Therefore, S = T = 51. Recalling that the angle sum of a triangle is 180 degrees, we get S + T + y = 51 + 51 + y = 180. Solving for y gives y = 78. The answer is (D). 4. If x = 3y = 4z, which of the following must equal 6x? Multiplying both sides of the equation x = 3y by 6 gives 6x = 18y. Hence, Statement I is true. This eliminates (B) and (C). Next, 3y + 20z = 3y + 5(4z) . Substituting x for 3y and for 4z in this equation gives 3y + 20z = 3y + 5(4z) = x + 5x = 6x. Hence, Statement II is true. This eliminates (A) and (E). Hence, by process of elimination, the answer is (D). 5. The average of four numbers is 20. If one of the numbers is removed, the average of the remaining numbers is 15. What number was removed? 6. The ratio of two numbers is 10 and their difference is 18. What is the value of the smaller number? Plugging this into the equation x – y = 18 yields x = 20. Hence, y is the smaller number. The answer is (A). 8. Seven years ago, Scott was 3 times as old as Kathy was at that time. If Scott is now 5 years older than Kathy, how old is Scott? Solving this system gives 14 1/2. The answer is (E).